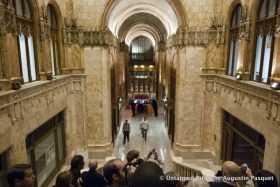 After its iconic neo-Gothic architecture and copper crown, the Woolworth Building is known by New Yorkers for being off-limits to the public, but Untapped Cities is your source to get inside the landmark. Next week, they’ll be hosting their uber-popular Special Access tour, which takes guests into the spectacular “cathedral-esque” lobby and mezzanine, as well as the cellar level with its abandoned bank vault and subway entrances. 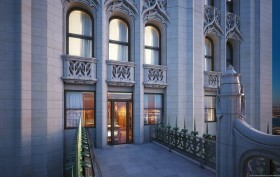 You’ll learn about the building’s history, restoration, and incredible interior Art Deco architecture. And for those true history buffs, next month they’ll offer a VIP version of this tour with building architect Cass Gilbert’s great-granddaughter, Helen Post Curry. SIGN UP FOR THE TOURS HERE! When the neo-Gothic Woolworth Building was erected in 1913 as the world’s tallest building, it cost a total of $13.5 million. Now, 104 years and a partial condo conversion later, its massive, seven-story penthouse has hit the market for an exorbitant $110 million. The Wall Street Journal first got wind of the not-yet-public listing, which could be the most expensive sale ever downtown, far surpassing the current $50.9 million record at Chelsea’s Walker Tower. Dubbed the Pinnacle for its location in the 792-foot tower’s iconic green copper crown, the penthouse will encompass 9,710 square feet and boast a private elevator, 24-foot ceilings, a 400-square-foot open observatory, and views in every direction, from the World Trade Center to New Jersey to the East River. 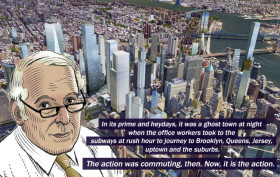 If we’re ever going to get a new Penn Station Madison Square Garden will have to move, so a group of urban planners has proposed relocating the arena to a nearby post office. 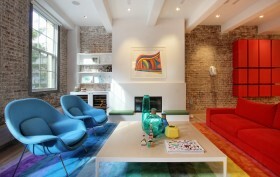 Ghislaine Viñas’ colorful and eclectic loft design seamlessly blends together in Tribeca. 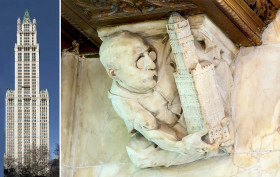 Ever wonder about those strange faces on the Woolworth Building? We’ve got the answers, as well as ten other fun facts about the landmark. Lots of Basketball player/real estate news this week. Jason Kidd puts his Hamptons mansion on the market for $7.995 million; Carmelo and LaLa Anthony check out a $15 million Chelsea penthouse; and Brooklyn Nets all-star Joe Johnson shops for a home in DUMBO’s Clocktower Building. Terra cotta in New York City: Our favorite buildings adorned in ceramic. 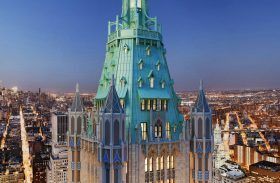 The 101-year old Woolworth Building has been in the news quite a bit lately, especially since it was first announced that the top 30 floors would be turned into 34 apartments; one of which is a nine-story penthouse is expected to hit the market for a record $110 million. But the Woolworth has long been at the center of New York life with its storied past and lofty 792-foot height. It cost $13.5 million to erect the tower in 1913, and the building was the world’s tallest when it first debuted. Though a number—50 to be exact—have surpassed it in height, the Woolworth Building has remained one of the world’s most admired for its detailed and compelling ornamentation. 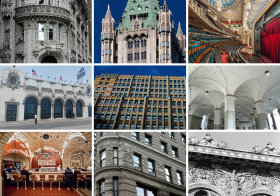 Like other prestigious companies of its time, Frank W. Woolworth wanted something unforgettable and the building’s architect, Cass Gilbert, certainly delivered. The tower is filled to the brim with mosaics, stained-glass, golden embellishments and of course tons of those carved faces and figures. First came the floorplans for the $110 million penthouse, then the first set of interior renderings, and now we have a new sneak peak inside the highly anticipated Woolworth Tower Residences. 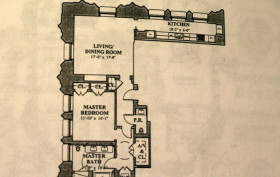 The Post has profiled unit 31A, a four-bedroom, full-floor unit on the market for $26.4 million. And along with a written description–“a kitchen with all the modern conveniences, a massive formal dining room, hidden bars, a library and…two terraces to enjoy the view from 31 stories up”– come two new renderings, those of the terrace and the kitchen. 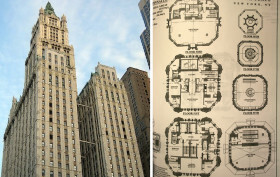 It looks like Alchemy Properties‘ plan to price the penthouse at the Woolworth building for $110 million has been approved by the New York Attorney General’s office, making it one of the most expensive listings to ever hit the downtown market at $11,700 per square foot. According to The Real Deal, who got a first look at the floor plans, the unit will be called the “Pinnacle” and host 9,400 square feet with about 500 square feet of outdoor space.